Slideshow: Let Slip the Dolphins of War! 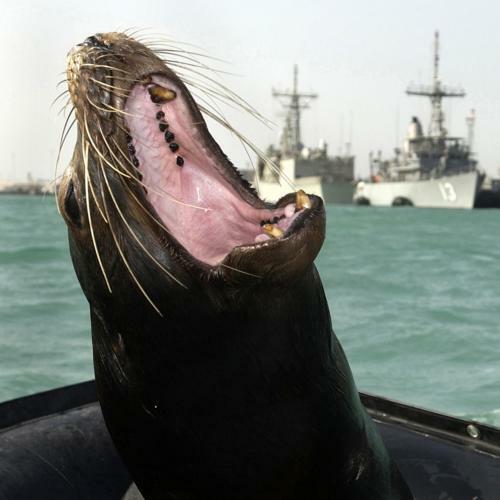 The prospect of Iran laying mines along the Strait of Hormuz is no laughing matter, but we did have to suppress a giggle when we found out what the U.S. response might involve: Flipper. Deploying dolphins to locate underwater mines (as a retired Navy admiral suggested in an interview last week with NPR) is, we learned, a tried-and-true military strategy. While we’re still waiting for Steven Spielberg to make a dolphin-themed follow-up to War Horse, it did lead us to wonder about what other strange ways animals have been deployed in military contexts. Dolphins are a covert underwater asset for both defense and attack purposes. Echolocation—a faculty of dolphins that makes them adept at locating objects—has been harnessed by the U.S. military for the last 50 years to find sea mines. The United States isn’t the only country in on this: In 2000, Iran purchased dolphins once trained by the Soviet Union to dive-bomb enemy vessels while rigged with explosives. Glow worms—the larvae of beetles and flies, which glow for mating or protective reasons—were jarred en masse and used in the Great War to provide illumination at night and in shady trenches, allowing soldiers to get some reading done. Dolphins aren't the only aquatic animals to be employed by the Navy: Sea Lions are another integral part of the Marine Mammal Program. During the Iraq War, many (including the 375-pound Zak, pictured above), served on patrol, though PETA protested their deployment, since "they weren't enlisted, [and] they know nothing of Iraq or Saddam Hussein." In Mozambique, African giant pouch rats are used to sniff out the landmines that scatter the countryside after years of civil war. Belgian NGO APOPO pioneered the idea, stating that the "HeroRats" can fulfill the same purpose as dogs, but at a fraction of the cost. Wojtek was a Syrian brown bear that served in the Polish Army during World War II. Found as a cub and raised by Polish soldiers, Private Wojtek was officially enlisted in the 22nd Artillery Supply Company. (His name means "happy warrior" in Polish.) While mostly serving to boost morale, his greatest moment of triumph came in 1944 during the Battle of Monte Cassino when he transported shells for Allied forces, before retiring to the Edinburgh Zoo post-war. During the Spanish Civil War, 1200 Nationalists and allies retreated from attack into a nearby monastery. To provide them with food, compatriots attached supplies to live turkeys; the turkeys were dropped to the isolated soldiers from planes, so that the birds would flap their wings, soften the landing, and provide a good meal. During World War I, warring nations utilized pigeons for reconnaissance missions to take aerial photographs of enemy targets. Pigeons were still in regular use following World War I—the Swiss military finally ended its carrier pigeon program in 1994 and Iranian security forces accused two pigeons they found near a nuclear facility of espionage as recently as 2008.